The Fantom Drives GForce Quad is the No.1 choice for creative professionals who demand Maximum performance, reliability, and most connectivity options for maximal flexibility, handling multiple demanding professional tasks with equal aplomb. It can be daisy-chained via FireWire and is even bootable on just about every modern computer, Mac or PC alike. The Fantom Drives GForce Quad features a sturdy, compact and versatile design, making it ideal for intensive professional use. The unique, fanless aluminum heat sink design for heat dissipation keeps it cool and quiet without noisy and failure prone fans. 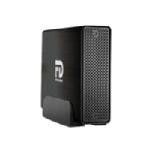 Fantom Drives GForce Quad includes virtually every modern interface, and is backwards compatible with USB 2.0 and represents the pinnacle of host connectivity allowing transfer rates up to 10 times the rate of USB 2.0.